When I found out about this swap, I had to join it! We are to make 10 peace-themed items, and send them to the coordinator-Holly. In return we will each receive 10 different items from the other participants of the swap. I saw these pens at Office Max yesterday, and they conveniently had a "buy 2 get 1 free" on all Pilot writing instruments. I didn't see the mini pens I normally buy, but I liked the idea of the rings so you can attach then pen to keys and bag zippers etc. 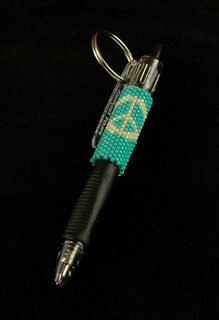 I designed the peace symbol last night, and beaded up the first one in turquoise. I think I'll make each one a different color combination so I won't get bored! I might have to add this design to my shop as well.